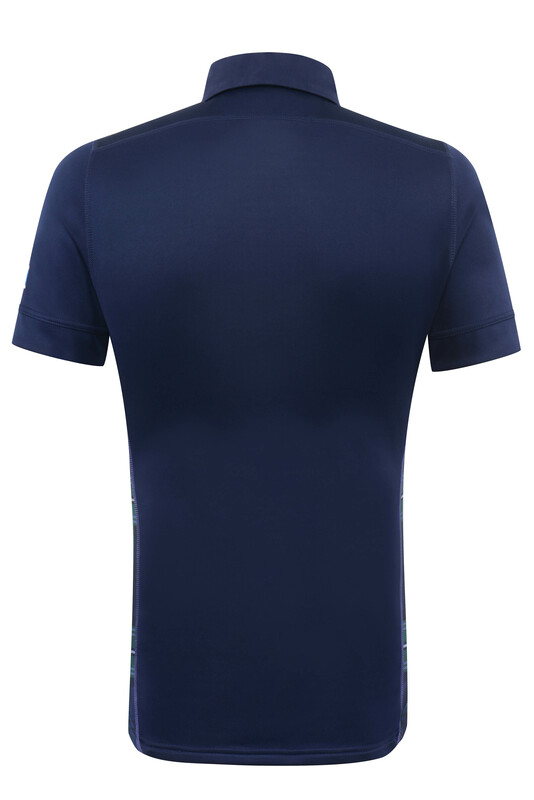 From the front, this shirt looks like it’s taken the 2013/15 recipe and simplified things even further. Gone is the white collar and placket, though brilliantly, the proper old-school collar is retained – viva la proper collar! 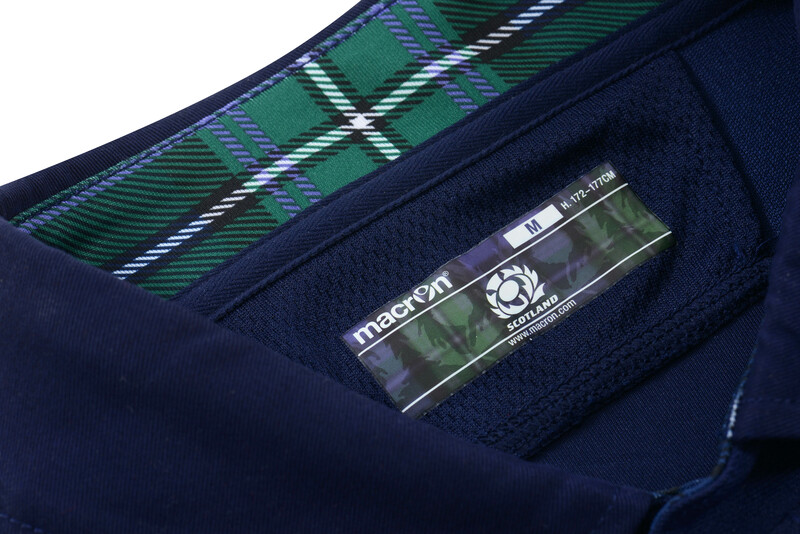 Instead, the main body of the jersey is plain flat blue from top to bottom, with just the white of the thistle and the Macron and RWC logos breaking the stark, restrained design. Demure, restrained, understated – it’s very Scottish you have to agree. But plain blue? That’s a little boring, isn’t it? Yes, not content with keeping things oh so Scottish and restrained on the jersey front, the sides of the shirt up the Scottish factor to hitherto unseen, Billy Connolly levels. 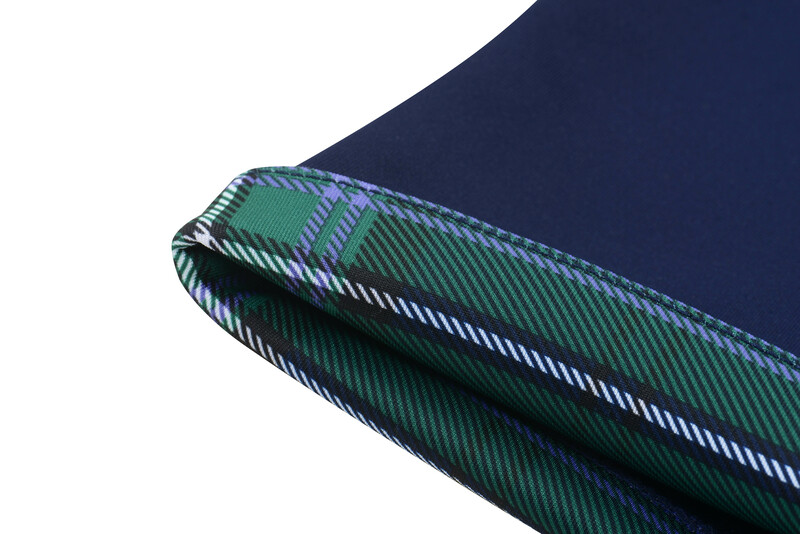 Running the full length of both sides of the shirt is some really cool really striking green, blue and purple tartan. Back in the mists of time, Scotland were very good at rugby. We know, mean, horrible rugby fans – this is quite hard to imagine given the last 10 years or so of false dawns and disappointments, but they were. They were so good in fact, that they won a Five Nations Grand Slam back in 1990. To celebrate this impressive achievement, the SRU did the most Scottish thing imaginable. Yes, they drank a shitload of whisky – of course they did, who could blame them, but no, not that. No they did the OTHER most Scottish thing imaginable and commissioned a special SRU tartan to mark their fantastic achievement. What’s more, the sleeves cuffs can be worn in two ways – straight and blue, as in the main shot of the shirt here, or in uber trendy roll-sleeve format, showing off the tartan trim in very cool fashion indeed. Could this be the first roll-sleeve rugby shirt? 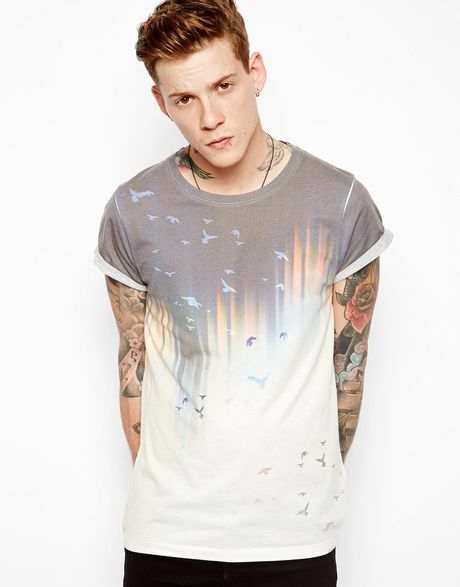 Perhaps, and while we’re no fans of hispterish high street trends, we really like the effect here. We joked when we reviewed Macron’s 13/15 home shirt that when the results were this good, they should let a fan design the shirts every year. Thankfully, it seems that Macron’s pro designers know their onions, too. They’ve nailed a blend of retro sensibilities and something bold, modern and different to once again create a shirt that’s going to be the envy of the tournament. And don’t you ever, ever get rid of that proper collar. Love it, it’s so refreshing and traditional at the same time, no theatrics, just getting down to business, let’s hope play on the field does it proud. Lovely design – got to give Macron credit. I’d never heard of them until a couple years ago, but apart from their last away jersey for Scotland their efforts have been a classy mix of modern and classic. 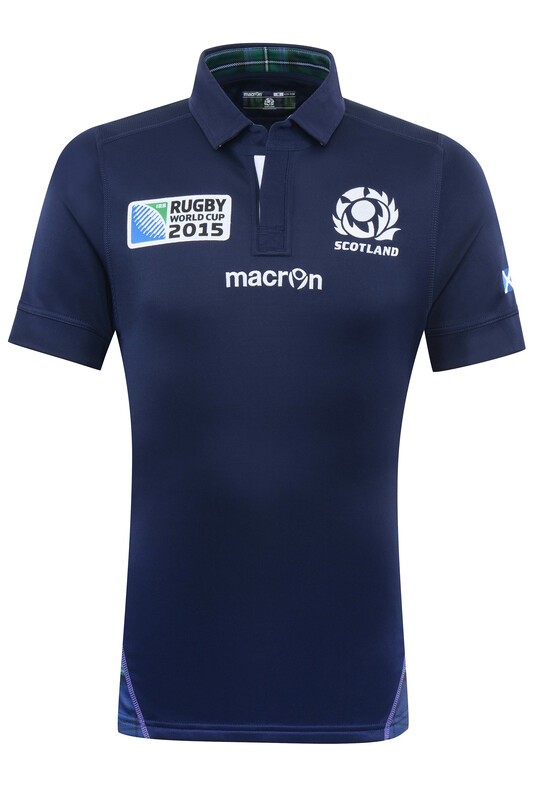 Minor, minor quibble, but I would have liked to see a white collar (on the outside – keep the tartan on the inside). 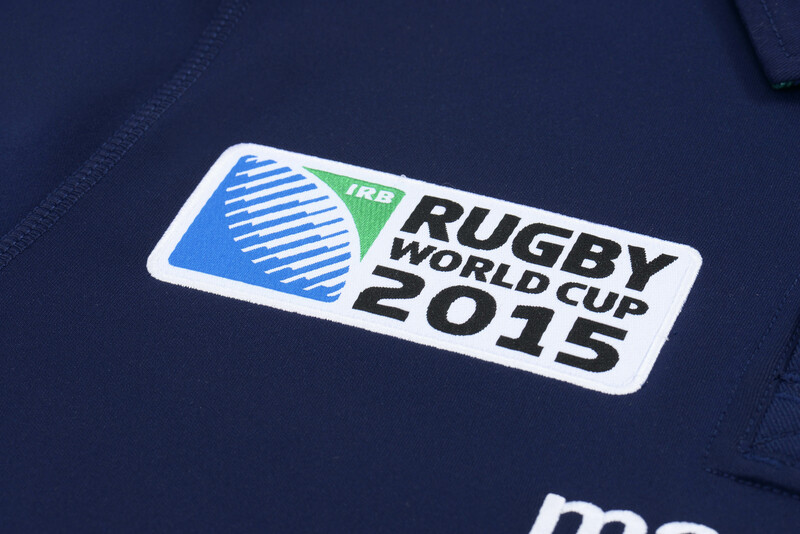 Oh, and the RWC logo is horrible, but I don’t suppose the SRU or Macron had any choice about that. 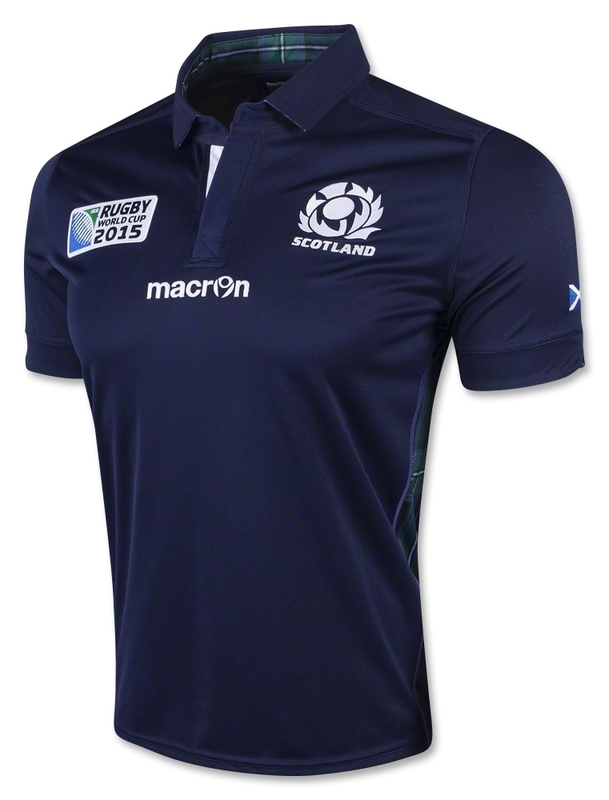 Think this is my favourite RWC shirt so far. I’m slightly dissapointed with England’s effort (will probably buy the classic), but I’d be over the moon if I was a Scot this September!